The debates on the future of Europe have experienced a new impetus in 2017, particularly after, in June 2016, a majority of British voters decided that the United Kingdom shall withdraw from the European Union. However, the Brexit referendum did not solely initiate a turning point in the history of European integration, but posed challenging and fateful questions for the remaining EU-27: Which Europe and how much Europe do we want? What concessions are we willing to make? On the EU level, intensive reflections on the future were set in motion. At the Bratislava summit in September 2016, the heads of state of the EU-27 reaffirmed their commitment to the European integration and adopted a roadmap for EU reforms. In March 2017, the European Commission presented its “White paper on the future of Europe” with five possible scenarios for the European Union in 2025. The 60th anniversary of the Treaty of Rome on the 25th of March 2017 was supposed to represent the culmination point within this process of reflection through a joint statement by the leaders of the 27 EU Member States and the European Council, the European Parliament and the European Commission. On the occasion of this anniversary, Gabriele Clemens traces the historical significance of the Treaty of Rome and its lasting question on the finality of the integration process within her guest contribution “60 Jahre Römische Verträge”. On the 1st of July 2017, the first European memorial ceremony in honour of Helmut Kohl reminded of the historical-cultural roots of the European unification, to which the former Chancellor and honorary citizen of Europe made a significant contribution. 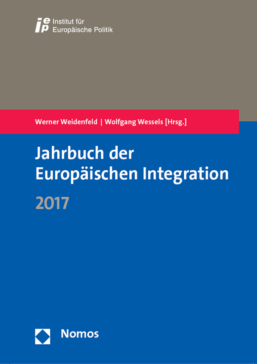 However, the view into the future is dulled: The seemingly revived integration dynamic does not deceive the “strategic speechlessness” of the EU leaders, according to Werner Weidenfeld. For many problems of previous years – may it be the migration crisis or the lack of necessary reforms of the Economic and Monetary Union – as well as questions of the future of the integration process; no sustainable nor innovative solutions exist. Only with regard to the Brexit-question are heads of state and government of the EU-27 surprising with unity and consensus. With the commencement of the exit negotiations, clear fronts against the United Kingdom developed and the chief negotiator Michel Barnier has taken up the difficult task to negotiate the best possible deal for the European Union and its citizens. The yearbook (Jahrbuch) devotes a separate contribution to the precedent Brexit. As an ideal case for a “known unknown”, academic work on the UK withdrawal from the EU increased, but in the wake of questions on the future development of the EU-27, the topic of differentiated integration re-emerged, as the article “Die Europapolitik in der wissenschaftlichen Debatte” (European Policy in the EU scientific debate) illustrates.